Whilst deploying Windows 8.1 with SCCM, I got the whole Task Sequence stuck to the point where Windows was asking me to choose a Wireless connection (or skip the step). I initially thought that the TS would be continuing underneath that interface so I left the office and the morning after the process was still stuck at that point. When I manually skipped the step, the Task Sequence continued with what was left to do. Well, in my specific case, that appeared right after the Task Sequence installed the drivers, so that means Windows recognized also the wireless card of the machine (Dell Venue Tablet) I was imaging. 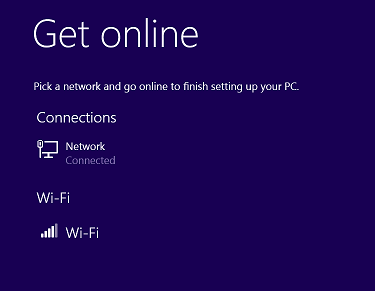 How do I skip the Get Online message from Windows 8.1? That’s pretty much it 🙂 Remember to update the OSD package content if you’re using SCCM (or else the Distribution Points would keep using the old xml file).